There's new music and then there's a new way of even thinking about music. One of NPR's "First Listen" current choices is Pantha du Prince's album, Elements of Light (out January 15). 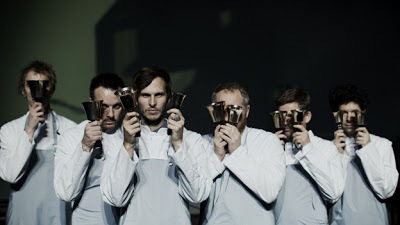 This is the stage moniker of Hamburg electronic music producer Hendrick Weber, who enlisted a Norwegian percussion group, The Bell Laboratory, to layer chiming bells over his electronic synths. NPR calls the resulting collaboration "dashing kaleidoscopic patterns." 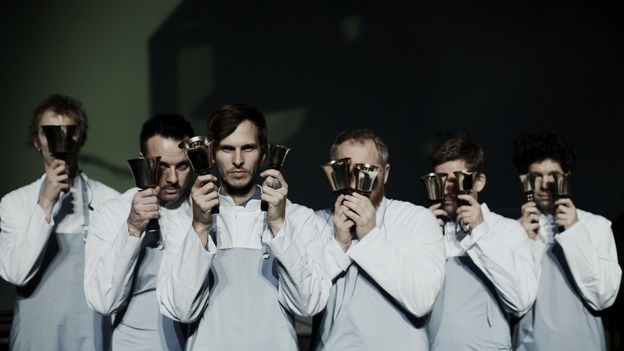 The group performed at Moogfest last fall, but in a scheduling quandary we missed out. The organic side is introduced in the first track, "Wave." This straight forward treatment brought memories of my church's bell choir where I grew up -- I'd be sure get to rehearsals early to be able the play the highly active middle C and C sharp. While the album has only five songs, it lasts almost 45 minutes. Nice background music but the digital overlay concept can seem repetitive after a while. I'd suggest skipping straight to the strongest track, "Photon," as an introduction. (The "First Listen" program allows listeners to choose songs individually or stream the album in its entirety.) I've been hearing this song on KCRW's "Morning Becomes Eclectic" and on its own, the sound is satisfying and intriguing. Then perhaps you could delve deeper, courtesy of NPR. Take a listen on the NPR "First Listen" website here.